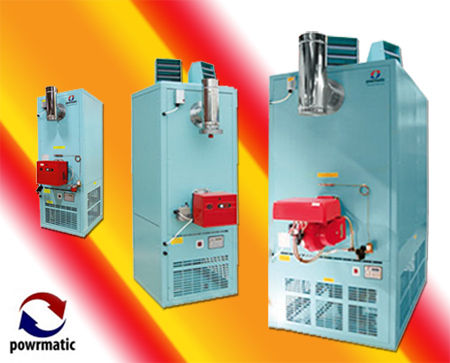 Powrmatic cabinet heaters are indirect gas or oil fired air heaters fitted with resiliently mounted fan and motor assemblies, stainless steel combustion chamber and mild steel heat exchanger. Heaters are available with a comprehensive range of oil or gas fired burners. A powrtrol control unit is supplied with every heater. ECA models are supplied with the mc200 controller. Oil 35 sec. & 28 sec. Painted to RAL6027. BS/RAL colours to special order. Complete with full operating controls.